This blog is not very active anymore due to my interests veering into other directions but I still gladly put up anything T&E related and relevant that people request of me. On that note, Trade, Law and Development, a student edited journal on International Economic Law published by the National Law University, Jodhpur is issuing a forthcoming special issue on trade & climate change and Mr. Thomas J. Vallianeth, the managing editor, has asked me to publish the call for papers here. I am only too happy to oblige. For full details and conditions, please also see the Trade, Law and Development website. original, unpublished submissions for the Special Issue on Trade and Climate Change for publication as ‘Articles’, ‘Notes’, ‘Comments’ and ‘Book Reviews’. Preference will be given to submissions that espouse perspectives of developing and under-developed countries. T&E Nexus wishes all prospective authors best of luck! Just a quick heads up on a couple of new publications out on trade and environment. It includes information on the operation of the tariff-rate quotas established under the Uruguay Round Agreement, the implications of sanitary and phytosanitary restrictions on trade, and the growing controversy over genetically modified organisms. In addition, several chapters analyze the interaction between agricultural trade and environmental concerns. Put simply, if you are interested in trade and environment from an agricultural standpoint, give this one a look (official publication date April 30th). This book relates the analysis of present-day problems and trends (1960-2010) to clearly defined long-term objectives based on the concept of sustainable development. It covers the use of non-renewable resources in the OECD countries in a global perspective, while the regional environmental impact of economic growth is discussed in a European context. The book also includes an analysis of the potential conflict between pollution abatement costs and economic growth. 3. Rafael Leal-Arcas has a new book out on climate change and international trade. This one, to me at least, is especially interesting because of a discussion in it on inserting climate goals within regional trade agreements, given their proliferation – especially bilateral – in the international trading system. 4. Rounding things off, James K.R. Watson, has a new book out called “The WTO and the Environment: Development of Competence Beyond Trade“. This book is a review of the development of the WTO dispute resolution procedure and the power and influence it has gained over the practises of the member countries as well as in other international treaties. The book addresses the development of environmental competency in the WTO and examines the arguments of those who oppose WTO rule making with impacts on the environment. The book also includes an interesting discussion on the WTO-MEA interface and provides some specific policy recommendations for moving forward. I am finishing a couple of publications as well as hoping to enjoy the summer a bit during the following weeks. Thus i’m putting the blog under summer hiatus. Enjoy the summer and thanks for a great spring session! 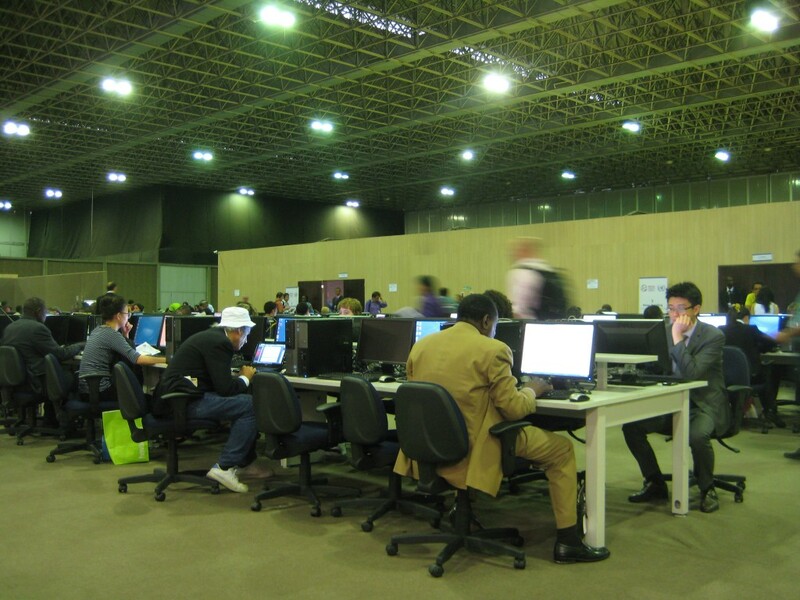 What is it like to be at Rio+20? It can be hard to get a physical “feel” for attending a mega-gathering like this from only reading on websites, so I will write out a short piece on the everyday experience of attending the conference. Unsurprisingly, the most striking immediate impact is the scale. The food court alone is the size of a hangar, security is everywhere, and a hundred things happen simultaneously at all times. Still, there is a palpable sense of calm throughout the convention center. I hesitate to say that the atmosphere is subdued, but I wouldn’t exactly say it’s explosive either. Not to suggest that this is a bad thing. We all remember the “chaos” of the Copenhagen climate summit, and certainly Rio+20, from what I’ve seen, seems downright serene by comparison. Not once have I felt crowded anywhere in the convention centre. 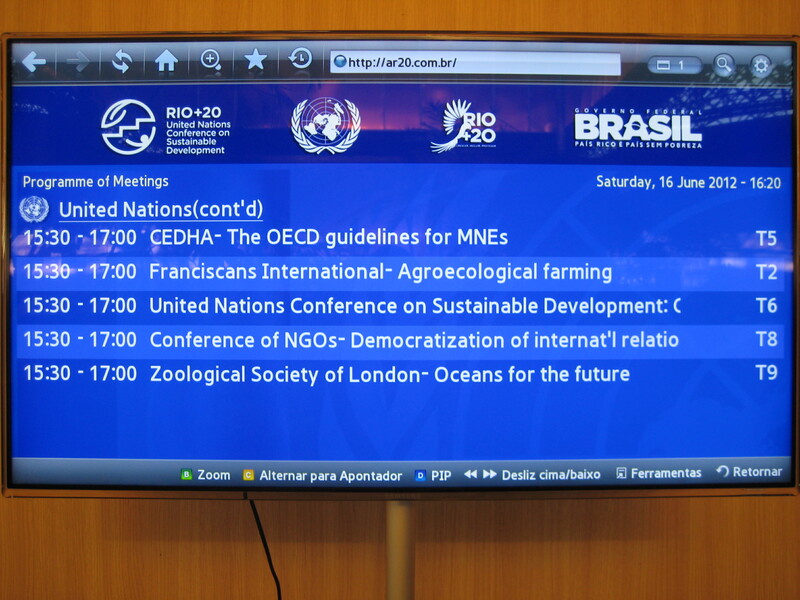 Information about the time and location of meetings is provided in real time on flatscreens (think airport terminal) in each of the conference centers. But of course, most people just walk with laser focus to the one or few meetings that they are personally engaged with on that day. It is understandable, but also a bit of a shame, considering the abundance of expertise and interesting events that go on. Be that as it may, this is still clearly the event of the year for most people attending, and the atmosphere and quality of presentations shows it. Put simply, people bring their “A-material” and their best shirt. Language issues do occur on occasion, although the designated helpdesks scattered around form little islands of help provided in advanced english. Put more tangibly, if your portugueses is as bad as mine, you might be using some hand signalling at the food court and in a myriad “little” situations around Rio+20. Obviously, when compared to other parts of Rio, the service in English is still excellent. Traffic in Rio is terrible however, full stop. The official shuttles remedy this to a certain extent, but many participants will probably still see their taxi budget overstretched from sitting in traffic. Riocentro, the main conference centre, is clearly out of the way from the city proper. Consequently, many of those who opted for the more “touristy” areas of copacabana and ipanema might end up regretting their choice, especially if they need to swing back and forth a lot and spend the time that goes with it. On the physical area itself, and considering all the hubbub surrounding the conference, one might also wonder if it is very “built up”, perhaps flashy even? 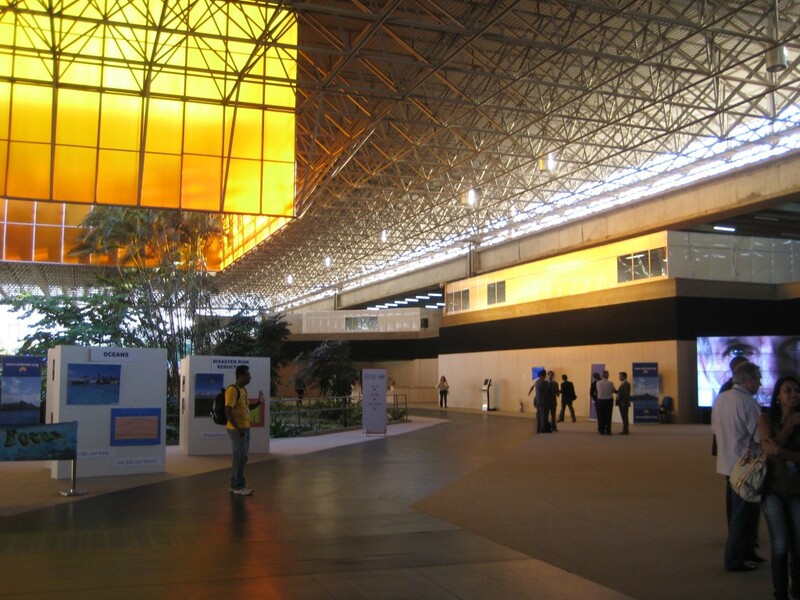 The main Riocentro area goes in a very minimalist style, clearly favouring simplistic wood panelled function over form. There are very small art exhibits scattered here and there, but dwarfed by the giant buildings they become curious and overlooked asides rather than actual attractions. 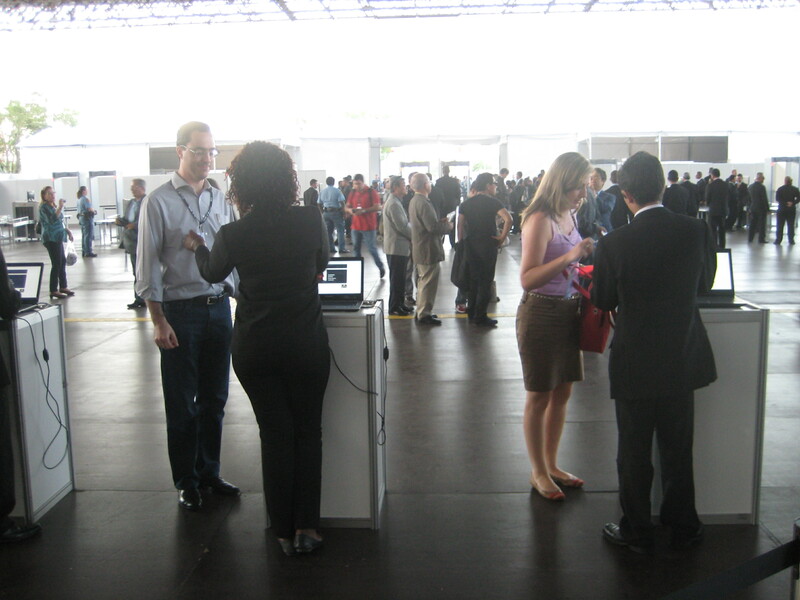 So what are the coffee conversations going on at Rio+20 in between the events? It’s early still so of course there are no news yet on an actual rio declaration (though everybody knows it’s looking grim). Once anything on this leaks out, I’m pretty sure it will dominate the water cooler conersation. But lacking that, people seem to discuss their trials and tribulations with traffic and, of course, their work and what they do. However, there doesn’t seem to be that much “cross-breeding” going on between people of different discplines meeting spontaneously at the conference. Everybody is too busy for that. Even I could be schmoozing random people in the cafeteria right now, but instead I choose to produce some work, and most seem to make the same choice. Of course, this short description just wouldn’t be complete without some comments on Rio itself. Temperatures during the day vary between 25 and 29 degrees, it’s humid but not oppressively so, and caipirinhas on the beach are about 8 BRL (around 27 SEK or 4 USD). In short, it’s a very nice location for a conference. So the great location, of course, is also one of the most frequent topics of conversation at this early stage of the conference. There are many more days to go, but I hope this short description has provided a less “sterilized” account of attending the behemoth that is Rio+20. The next couple of days will be an experiment. I am in Rio de Janeiro, Brazil for a few days covering Rio+20 for SEI. I will tweet and write blogposts about the conference, so it’s a nice jaunt into journalism for me and very different from my usual work. My presence at Rio+20 is broader than just trade and environment issues and will cover many aspects of climate change and sustainable development. My main event schedule looks as written out below for the next couple of days. I’ll be writing about all these here, as well as on the “experience” of Rio+20 more generally. The ones below are the events SEI has helped organize and are involved in so naturally they will be my focus. However, I do plan to also engage with as many interesting other events as I can during my time here. This will be as interesting for me to try as I hope it will be for you to follow. Looking forward to get to Riocentro tomorrow (official conference venue), and very glad I have my badge and registration done already. So the EU is clearly still roiling around in crisis land, with fears over a greek exit from the EMU probably being foremost on people’s minds at the moment. However, there is a lot of movement by the EU elsewhere that is getting much less attention. Especially on trade and environment related issues, so I’ll go through a couple things that are good to be aware of. First, France (or rather their new minister of “industrial revival”) is starting to make more noise with regards to carbon tariffs. In this article, which looks at this, they rightly point out that the idea was already brought forth by the Sarkozy government in the past, but ultimately didn’t get much traction. I’ve written quite a bit on carbon tariffs already, so we’ll see how much of this is hot air and posturing and how much is serious intent to expend political capital on putting in place external measures. But still, France is one of the powerhouses of the EU community so it is far from unimportant to note that their new government comes out swinging this early on carbon tariffs. Second, European solar manufacturers are gathering for a big push to file a trade complaint with Brussels against Chinese market distortions. By doing this, they are following the lead of their American counterparts who similarly filed a case and got the US to slap antidumping duties onto imports of Chinese solar equipment. Does this mean Brussels will for sure go the same route? No, of course not, but the American precedent is likely to give them a bit of confidence in going this route. Also, for non trade nerds, this does not mean a WTO case will come out of this automatically. However, severe EU antidumping duties would make it a lot more likely as China would then see both key markets for solar basically putting up the shield against them. Third, in EU renewable energies policy there are some tendencies that point to uncertainty beyond 2020 (which is the date that current measures stretch out to and have as their goal). Plenty of investors are likely to look at the uncertainties that surround a lot of renewable energy policy and think: Then what? 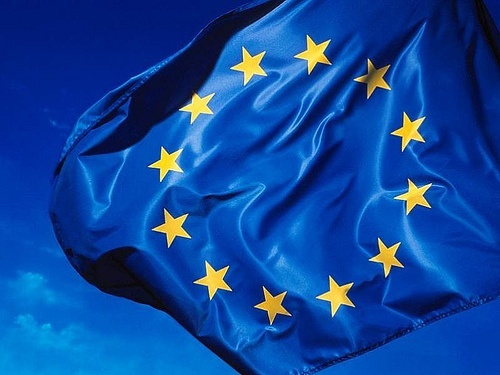 The EU-RED was after all a hastily put together piece of legislation, and much hooplah has surrounded it, including doubts over its effectiveness and set of definitions. Getting more certainty on just what the thinking is in the commission will be helpful, though I’m not entirely sure that they have a firm idea themselves at this point. It’s still 8 years to go, but it’s still not exactly an ocean of time considering the lead time of investment and the current uncertainties prevailing (and all the debate that will surely arise because of this). Next months publication might give some indication of what the thinking is going forward. Fourth and lastly, I wanted to note that DG Trade (the EU Directorate General for Trade) are rightly proud that their first EPA (Economic Partnership Agreement) has gone live with an African region. By gone live I mean it is starting to be applied with regards to four of the countries that have been involved in the negotiations: Madagascar, Mauritius, Seychelles and Zimbabwe. The EPA:s are an interesting instrument that have had some trouble in the past to produce results in the African region. The word “region” is likely to be a key word there since the complexity of the negotiations are upped significantly by having these agreements struggle for regional integration alongside development. Oh, and for those of you who began reading this paragraph thinking: What on earth is an EPA? You can find info here. With regards to trade and environment, EPA:s hold great potential to deal with “adjacent” areas such as sustainable development as part of these bilateral negotiations. It is no secret that I am personally quite intrigued by the potential of bilateral agreements for moving environmental issues forward, so this is one instrument to watch, though it is something of a special case compared to “vanilla” FTA:s due to their strong development focus. Although that distinction of “normal” FTA is becoming more and more blurred as they are increasingly the primary tool for moving trade relations and governance forward, and with it follows a more holistic approach when engaging with them as well as, arguably, a deeper political aspect. Skepticism ahead of Rio+20 is rife, let’s be honest. And for good reason: We are still a long way from having even a proper definition of Green Economy, a concept which is considered the cornerstone of the conference and of sustainable development at large. Meanwhile, the European financial crisis dominates many a political mind, with environmental conferences finishing, at best, a distant second on the current political radar. Amidst all this doom and gloom, I recently had a rare chance to hear what one of the true leaders of the environmental movement had to say about all this. 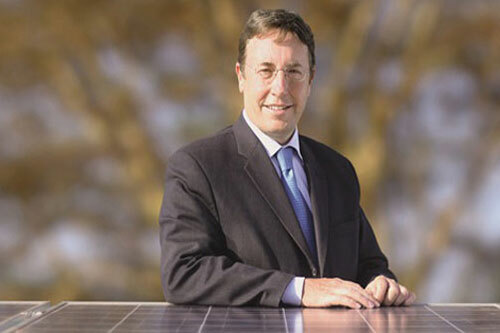 More specifically, I attended a small-group meeting on the 23rd of April with Achim Steiner, Executive Director of UNEP. He spoke in an informal setting in Stockholm in the think tank cluster where I work. This talk was especially interesting since it concerned primarily big-picture issues ahead of Rio+20, many of which I consider supremely relevant and symptomatic also of the environmental movement as a whole. But I am getting ahead of myself. My immediate reaction, when settling down to listen, was that you wouldn’t think the environmental movement was in any sort of crisis by just observing Mr. Steiner. Calm and collected, he talks of issues of momentous importance with requisite gravity, but also possessing the tempered intellectual detachment that undoubtedly is needed to observe the troubled state of the world as it truly stands. Agreed. In fact, a continously future-oriented approach can be tricky since it inherently lulls you into the feeling that the time that really matters is always just beyond the horizon. Indeed, it is this very collective delusion that completely runs much of the public stance towards climate change and other severe environmental problems. Larry King, the famous CNN host, perhaps said it best: “Nobody cares what happens 50 years from now”. Particularly if such caring implies that something onerous must be done right now of course. The word change was one that also ran like a thread throughout the stream-of-consciousness style of the talk delivered by Mr. Steiner on this day. Even UNEP itself, the premier world environmental organization (and a likely candidate to expand into a true world environmental organization at some point) is changing rapidly. On this note of change, Mr. Steiner uttered the unfortunate opinion that I myself hold, which is that Rio+20 is unlikely to be a “game-changer”. It will, in all honesty, probably not be the conference that will be talked about generations from now. Why? Steiner jots it down to the simple point of lacking political will, without going too deep into why this is. As someone who is very interested in the changing geopolitics of the world I have a few guesses, but I’ll resist the temptation to go off on a sidetrack here. The important thing, Steiner continued, was to keep the faith. Rio might not be the watershed moment that we all long for and want to see as soon as possible. However, he continued, it is the faith of civil society that is important at this juncture, and particularly in the case of a “blah” Rio+20 outcome. Again, I couldn’t agree more. The environmental community at this point is sufficiently hard at core to withstand the blows of a failing multilateral system, but how robust is the engagement of civil society? Arguably, it’s nowhere near as robust as we would like, and further interrupted momentum can take a long time to rebuild. So, considering the implications, let’s not kid ourselves and just call a spade a spade. Disillusionment rules the roost right now, even in environmental institutions and in an increasingly skeptical civil society, whose financial reality is being turned upside down on a daily basis. An alarming signal, that Steiner also pointed out, is that the environmental movement is not all that young anymore. Many of the people working on these issues have now been in this “game” for 20-25 years. And it is exactly among these people that disillusionment seems to be most rampant. This is disturbing, but I wager that it also points to a certain subtle hubris that has existed in the environmental movement: That of success in splendid isolation. That is to say the belief that the movement would somehow organically transform the state of the world through its own momentum and without really needing outside help from “old” society. Nope, turns out we still need politics, finance ministers and civil society to be on board with this. It’s just that the true inertia of these systems is finally beginning to dawn on the brave souls that led the initial charge of the environmental movement, and this realization is perhaps depressing a lot of these “old hands”. In any case, Steiner continued by noting that he thinks Rio+20 is unlikely to do any damage either (a statement that is pretty indicative of the expectation level in and of itself). So what to do? Here is where Steiner contrasted the decidedly gray state of things as they stand with the key questions and actions for moving forward. Number one on the to-do list: The ability of instituitions to create imperatives for action. That is the key question according to Steiner. The reasons for this are many in his opinion. First of all, we now live firmly in the age of the anthropocene. Put simply, human activity leads environmental change. However, this realization remains largely theoretical on most levels, and this prevents us from generating fitting responses to what is happening around us. More than this, he continues, a separate problem is that even if we had the required level of comprehension of this fact, our institutions are stuck in a largely obsolete state. The speed with which this change is happening is something our current social, political and economic systems are simply not equipped to handle. So how to change this? Well, Steiner suggests that a “big one” to embrace for the vanguard of the environmental community is becoming more economically literate. The debates on environmental issues all too often stop flat on questions of economics, employment, growth, trade and competitiveness. This will not do. The environmental community must learn to be comfortable with these questions, something they are clearly not at the moment. Put simply, the environmental knowledgebase must be economically viable. Lacking this, there is a risk that the superficial penetration of many of these supremely important concepts becomes chronical and effectively neutered. As for UNEP itself, Steiner’s ship to sail in very troubled waters, the institution is given a lot of responsibility,but perhaps not the requisite influence and power it needs to actually exact the change that is needed. Certainly Steiner seems to think so. He suggests to take the organization to “the next level”. That is to say the institution must be transformed to be able to deal properly with the real scope of the issues that it is facing. Almost everyone agrees that environmental governance needs to be improved, and Steiner is adamant about putting in place a strong “anchor” environmental organization as a foundation from which to work. Without a strong core, governance will always suffer, and environmental issues will continue to be secondary, at best, to other concerns. But governance of course extends beyond just the multilateral form. Arguably even more important in the coming years will be the role of governments. More specifically, for governments to properly capture in laws & regulations the societal “streams” of public choices and priorities that are currently ongoing. That is the job of government after all, and it is especially important now to facilitate public discourse and choice. Importantly, Steiner suggests that governments must also become much faster at detecting and channeling this public choice. It is a classic democratic idea, the state as a vehicle for the citizens, but it’s a very important one, and an idea that the private sector should also have no trouble coping with. Reflecting broadly, Steiner ended his take on the situation by wishing that one day, hopefully we will live in a world where the environment ministers are the second most important ministers after the heads of state. But to get there, the institutional and governance questions need to be solved. It is lamentable, Steiner also notes, that UNEP was born by being put into an environmental “box”. A box that it is now struggling to get out of as the true nature and scope of the challenges facing it are becoming clear. And on that note, perhaps the very idea and concept of Rio+20 does make the conference truly worthwhile after all. If just for a moment one lets go from the results-oriented mindset that demands solutions delivered yesterday, and instead witnesses the conference in a more benevolent light, seeing it as an attempt at just the type of creative interaction that Steiner hopes for, and that is so sorely needed at this stage. At least seen from this perspective, the conference might even already be a success. The WTO Appellate Body just came out with its latest ruling in the long-ongoing US-Mexico tuna dispute. Now, tuna-dolphin has a pretty bad connotation in the environmental community, where it primarily brings to mind attempts from the WTO to undermine national regulations for consumer protection and environmental improvement. This is probably not an entirely fair characterization, but let’s just say thank goodness that Shrimp-Turtle came along and restored much of the environmental community’s faith in the Appellate Body’s ability to reach reasonable decisions that involved environmental overtones. So what does the latest part in the Tuna-Dolphin saga has to say? Well, quite some interesting stuff since it actually goes into things of systemic relevance. Most talked about is what this will mean for so called “eco-labelling” schemes going forward. Of greater systemic importance is the Appellate Body’s general finding that the measure at issue – the US label, which also does not permit labels that deploy another standard – is a mandatory technical regulation and thus subject to the TBT Agreement. The US had disputed this position, pointing to the fact that eligibility for the label was not an importation or marketing requirement. Instead, Washington maintained, the importance of the label was exclusively the result of consumer preference. In siding with the panel experts, the judges criticised the US measure for establishing a single and legally mandated definition of the term “dolphin-safe”, whatever context it may be used in. “In doing so, the US measure prescribes in a broad and exhaustive manner the conditions that apply for making any assertion on a tuna product as to its ‘dolphin-safety’, regardless of the manner in which that statement is made,” the ruling concludes, referring to the question of whether the measure is mandatory and voluntary. The ramifications of this finding for other labels are yet to be seen. But experts immediately point to the dispute of what the term “organic” means and whether organic can include genetically-modified organisms. With another label dispute in the pipeline – an Appellate Body decision in the COOL dispute is set to be released this summer – this year is set to enlighten the critical relationship of trade, market access, and labels. Clearly, the importance of this label in terms of market impact was given quite some weight. The US probably thought they had a pretty strong case when being able to show that importation was not dependant on the label, but the AB seems to think these initiatives run deeper than that, as do arguably their effects so perhaps it is appropriate (though setting up for a more complicated analysis). Put simply, the scope for what constitutes a mandatory technical regulation seems to be nuanced with this ruling. Interestingly, this is about “owning the concept”, as much as it is about regulation. The US clearly sought to control the “dolphin safe” label, and with that will for control came WTO responsibility that the AB apparently did not think they fulfilled in a satisfactory manner. So yes, what this means for eco-labelling remains to be seen, but perhaps something can be tentatively teased out already: These labels are certainly not regarded as some fringe activity, with clear competitive advantages being acknowledged by the AB. This is obviously dependant on the support and ambition of the label, but the focus on the attempt to control the conceptual basis of the label puts an abstract twist on eco-labelling that will make it harder to weasel ones way out of WTO responsibility through regulatory wizardry. Thus, due to their market impact, the AB seems to require a deeper approach to labelling that go beyond just importation requirements, which of course will be important if other environmental labelling schemes ramp up in speed and importance. That is to say the voluntary nature of these labels cannot necessarily just be a legalistic construction, with recognition that the economic and competitive implications might nevertheless make them “mandatory” and thus subject to TBT. Definitely an interesting ruling coming out of the AB. I haven’t really gone into detail, but it seems to me that the decision to reject the AIDCP as an international standard still leaves the door open for more stringent and fairer labelling schemes that are more generally applicable. It’s above all the even-handedness of the US labelling measure, or rather the lack of it, that seems to have bothered the AB in reaching the conclusion that it had discriminatory effects. And indeed this would be entirely in line with the mission of the multilateral trade body. That quote is from an enjoyable article by Catriona Mckinnon that I came across recently. It sets the stage nicely for some thoughts I’ve been having lately on the concept of intergenerational climate change justice. This little string of philosophy is something of a departure from my usual writings on more closely linked trade and environment issues, but I hope you’ll enjoy it. With regards to intergenerational justice, first a note on justice itself. It is not knowing what the right thing to do that is fundamentally at issue here with regards to intergenerational justice on climate change. Philosophical tools can help with that, such as Rawls famous ‘veil of ignorance’. As interesting as this is, reality is not quite so pure. The hard thing is to actually do these right things despite the circumstances being what they are, and not try to act as if you were connected to circumstances other than the ones you are actually in. It is ultimately impossible to separate any agent from its circumstance, no matter how philosophically rewarding it is to attempt these types of grasps at objective truth. Put more practically, if a person actually experienced Rawls “original position” and came to the conclusion that a certain course of action was the right one to take, it would not necessarily be the one he actually took once he was put into an actual circumstance, where specific incentives and constraints would apply to him. Appeals to us entering “public man mode” when looking at things such as intergenerational equity may thus be unproductive as an instructional mechanism for how to achieve justice in this area. Put simply, the gap between a truth arrived at through objective examination and how to actually apply that truth so as to achieve the result that truth suggests, is so big as to be a chasm. This since we, always and to a great degree, are forced to act under the constraints and incentives of our positioned circumstances. To combat this fundamental divide between knowing what to do and actually acting on it on an indidivual agent level (particularly when this goes against the interests of the agent when considering the circumstance he is in i.e. alive today as opposed to tomorrow in the case of climate change) appeals are often made in various forms to a sort of “meta-solidarity” that hopes to transcend even negative consequences and circumstances of the agent in order to act on what is determined as “right” or “true” when having examined the problem as an objective one. This appeal troubles me, and strikes me as largely unrealistic to hope for as a primary working guide for action. Why should we trust the more general to ever trump the particular in terms of where our loyalties lie? It seems to me that the opposite is more “natural” in how we conduct our affairs the vast majority of the time. These appeals to meta-solidarity seem to me to be little more than the old hope for people to adopt the mindset of a “public man” that takes the interest of “society”, and basically lumping these things as if they were coherent decision-making units. But there are no such single entities in reality. Fragmentation of, and differences in, positioning between agents is what we have to deal with. Thus, knowledge is not enough. No generation wants to be the “middle” one, the transition period where the seeds are sown but little is reaped, and control of “objective” knowledge and “truth” does not change this fact, since these are not one with action guidance. In a few other articles and writings I’ve seen (both academic and journalistic), shame is also proposed as a potentially potent weapon to exact the change we want in terms of intergenerational climate change justice. Typically, authors are interested in something along the lines of the successful World War One poster ads that had a daughter ask her father “What did you do during the great war, daddy?” i.e. an appeal to future self-respect by acting courageously in the moment, rather than experiencing the shame of having been someone who shirked his duty during the war. Shame is a powerful tool, particularly when phrased in such an evocative manner as in that war poster, but is it enough? There is nothing humans tend to be so creative about as minimizing shame and inventing brilliant narratives for why things don’t apply to us but to everybody else. For example, note people with massive carbon footprints who do the occasional fundraisers for climate awareness, thereby OK:ing themselves in their minds. There is something positively Catholic about such mental forgiveness of ones sins, but unfortunately climate change is not a matter of belief, and that footprint does not change despite the fact that we are very good at making ourselves feel better about it. So the intergenerational climate justice aspect is looking tough to move forward at the moment, at least without a better frame than appeals to wishy-washy concepts of meta-solidarity or the whip of shame. That in and of itself is a shame, because truly it is a voice that is handicapped in its own advocacy efforts. The struggle with accommodating power shifts in international economic governance. The rise and acceleration of regionalism, spearheaded through international trade and the formation of trading blocs. The uncertain future trajectory of globalization and the internationalization of production processes (vulnerabilities and opportunities). The decline of international top-down regulation and the rise of international “informal” law making structures. The complicated new role of the sovereign nation state as impacted by points 1-4. I will go into this general situation a bit as several of these are, in my opinion, “root” causes and drivers of many issues and problems in governing both trade and environment/climate. These are incredible figures whose acceleration makes it increasingly untenable for the global community to ignore the tensions that are caused by this new order of things. In another highly pertinent speech Lamy basically made the argument, though with appropriate subtlety, that we also need to rethink what sovereignty really means in a modern world where interdependence is greater than ever. In this situation where local politics, not global politics, determine the global governance agenda, problems arise due to it clearly not reflecting the reality of what is actually happening in terms of international interconnectedness. The old paradigm of the Westphalian order of 1648, with national sovereignty as a core, is crumbling. But it is not crumbling quietly or without friction. Indeed, the current problems we have to form a functioning equity system in terms of responsibilities on the climate side and trade (and in many other areas) is directly linked to still having this prevailing model of political national sovereignty while international commercial relations follow very different rules indeed. People see this and term it a “low trust” environment between nations. Which it is. But it is important to not stop there. Trust is built on a bedrock of common values, but what we have today are two highly different value paths experiencing friction in between themselves as they attempt to navigate around each others existence. To solve this problem of the Westphalian order of sovereignty visavi modern interdependence, I do believe like Lamy that leadership is a key issue. But it is not THAT we need leadership that is at issue. It is WHO should be in a leadership position and to what extent that is the tough nut to crack. Fundamentally however, this question of who still feeds in to the traditional paradigm of sovereignty, where culturally coherent nations are still the “units” among which the “great game” is played. In the modern commercial world of deep interdependence however, these units are less self-sufficient than ever before, restricting their operating space and redefining their traditional role as regards the outside world. Put simply, one could make the slightly vulgar argument that nations are basically a group of cultural units that keep their raison d’ etre through clear cultural autonomy. With less of such autonomy available where interdependence is no longer a choice but simply the state of things, the fundamental core that underlies sovereignty is put under considerable pressure. To fashion “international governance” in such times is difficult. Most everyone agrees that current attempts at “world governance”, if one can even consider such a thing to exist, do not reflect the reality of power dispersion that the world is in the middle of. Indeed, despair that we will ever be able to conjoin issues harkening back to sovereignty and national political games with the current order of commercial interdependence have lead many to simply believe that there will be no solution to issues that require this synergy. Alan Oxley, an Australian trade advisor, gave a controversial talk at a recent seminar where he posited that the current “leadership” debate is completely misaligned, and that this was proven by having 20 years of climate change work but actually going backwards in progress. Further, that unproductive sidetracks of unilateralism would be the result of continuing along the non-functioning multilateral paths that we currently have. Connecting back to sovereignty again, his fear of unilateralism is ultimately a fear that the sovereignty aspect of national politics would prevail over the global mindset, with further interdependence (including the kind that is truly needed, as is the case with climate change) shunned instead of dealt with head on. Oxley is a controversial figure, but his fear of unilateralism and its greater focus on national priorities is of course not entirely without merit. We probably have not done a very good job of sequencing our multilateral efforts, choosing to ignore fundamentals that would have been better to focus on head on first rather than hoping that a magical future of cooperation will just kind of work things out if we try hard enough. It is not lack of effort that is missing, the problems are deeper. Is all this unkown? No, but it is clearly more intuited than it is posited outright. In its recently released biannual “Foresight Report”, UNEP laid out the 21 greatest environmental issues facing mankind. Appropriately, aligning governance with sustainable development was number one. And in governance, nothing substantial is likely to happen until we have a functioning system of equity. And the equity debate will not be solved without a clear solution with regards to relative sovereign national power, with this issue being unavoidable due to the main driver of relentless changes undergoing international commercial power and interdependence. This move towards a period of greater conflicts is a recurring theme in my writing and I do believe that we will have to face a “time of trials” before a new system of international economic governance can emerge that better reflects a new power dispersion. Of course, the WTO will continue to be the “front-lines”, as it is where the products of the low-trust environment ends up (A good example of despair over this low trust environment here). Now, there is an extremely important point of distinction that I believe is not being made all too often. Commercial interdependence is greater than ever before and sometimes seems to live a life quite of its own without much heed to specific nations. Meanwhile, however, commercial relations as they are governed by the WTO, which is a fundamentally member based organization, only have members that are sovereign nations. Thus ultimately these are the interests that are played out in negotiations. I believe this has profound implications for other trends, such as the move towards greater prevalence of soft law governance in many areas of international law. The reason being that there are interests lacking borders that find little other recourse than to engage in these types of initiatives. Simply put, much power in the international sphere today lack clear international institutional homes, as these tend to be dominated mostly by the compartmentalized interests of sovereign nations. Much of international power and many of the most pressing international issues seem to be becoming less and less dependant on traditional national boundaries, though our traditional paradigms of thinking about these issues linger on. As a slight digression but along the same vein, it is however encouraging that there are attempts at “catching” some of these changes. The WTO and OECD recently announced that they are changing from measuring gross trade flows to a value-based measuring system. What does this mean? Well, it means that we will get less distorted trade figures by looking at how much value is actually contributed by each country in the production chain, rather than overemphasizing (not to mention double-counting) the final shipping nation data and country of consumption data. This has been talked about for a long time so it’s wonderful to see that this is “going official” now. These statistics will improve our understanding of modern trade flows and production chains. Going back to the double-bind of sovereignty and commercial interdependence in a landscape of not-so-well-adapted governance structures, I recommend taking a few moments to watch the following videos. The first is a TED talk where a very dramatic Paddy Ashdown discusses related topics (TED is all about presentation after all). The second one is a talk at Chatham House where some truly big picture strokes are drawn on the current state of the world and globalization by Parag Khanna (who if I’m not mistaken is currently at one of the LSE think tanks). You might have to scroll down a bit to find it. If you are interested in these issues that I have been writing about here, I think you will find both of these talks highly enjoyable. In my next article, I plan to touch briefly upon the intergenerational equity question with regards to climate change and the current debates on the future of economic governance. I alsohope to write a technical piece/discussion soon as I both have some new thinking and find an absolute ton of helpful new material being published. My time is of course the prime limiting factor for how quickly I can get these out here on the site. PS: A question to readers. Does anyone know if there is a somewhat reliable indicator of world aggregate demand? Absolute trade figures are booming last I checked, but how is aggregate demand globally looking? Are we trading more and more within a landscape of overall shrinking demand or is aggregate demand following suit with the expansion in trade? This has been occupying my mind lately but I haven’t been able to find recent and reliable figures anywhere. Any trade economists out there who knows? Please write a comment or send me a private message if you know some good statistics for this.